The US is enjoying a economic bull-run, a strengthening dollar and record high business confidence but the same cannot be said of the rest of the world. Does such an imbalance represent the calm before the storm? “It’s a game of two halves” goes the often-used football pundit’s line. Well, in the economic world, it would certainly look like a world of two halves to the visiting Martian. On one side, we have the USA with its strong currency and cyclically low unemployment rates which are producing high global purchasing power. The US wealth feelgood factor is clearly there for all to see in the current valuations of the US stock market. 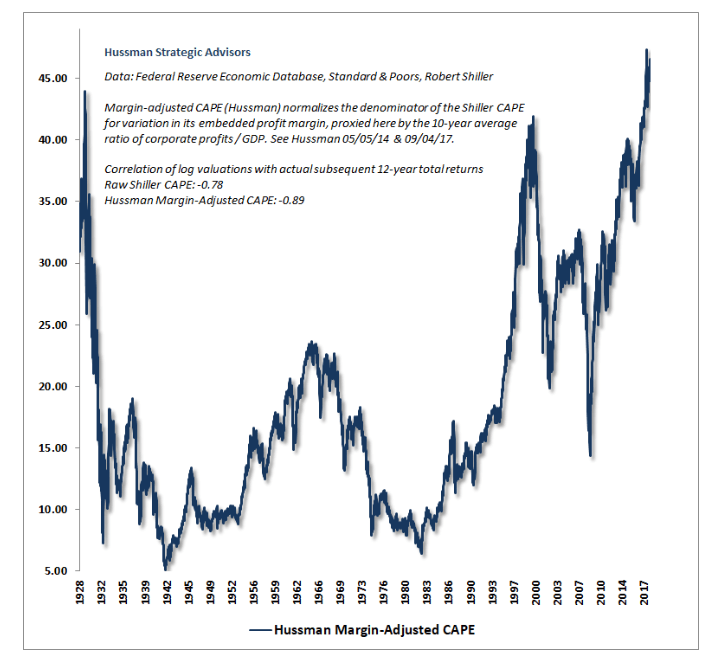 John Hussman’s favourite cyclically-adjusted price earnings (CAPE) is still there in all its glory – showing high American economic growth and the ‘FAANG’ stocks (Facebook, Amazon, Apple, Netflix and Google-Alphabet) are a huge part of this. 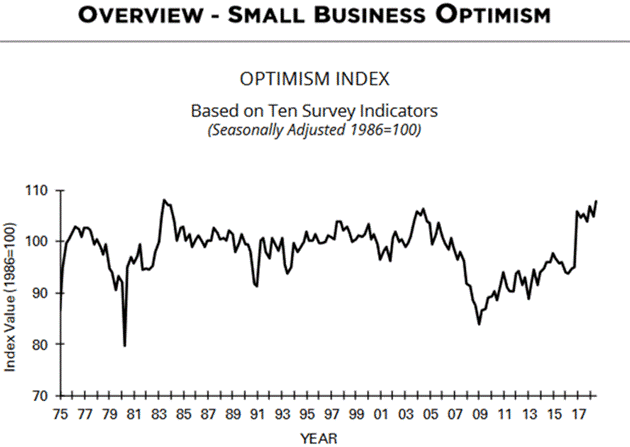 A hat-tip to John Maudlin’s Frontline this week for bringing us the Small Business Optimism index, a long-running series by the National Federation of Independent Business. Things really couldn’t get any better in the US, where as much as half of the country still seems to actively hate their president. Business owners, clearly, are almost at their most optimistic ever. What could possibly go wrong? American business optimism. Source: NFIB, John Maudlin. Well, many countries throughout the rest of the world are facing big problems. The trade wars and sanctions that so far have the most visible problems are in Turkey and Iran, but China, Russia, India and Argentina, among others, are also feeling the pressure. Even in countries with relatively strong economies, such as the UK, the weakening currency, amid rising interest rates and inflation, is decidedly worrying. Historically, global crises have come about after periods of excessively easy monetary policy (money printing) leading to growth. But it is often largely debt-inspired growth, where the search for yield has led to lower rates everywhere and higher risks. It is often the emerging market that sees the problem first, with weakening currencies, inflation and capital flight, before the full-blown world crisis occurs. So it should not surprise anyone if history repeats itself once again. America,Are we due a recession?,business,business optimism,global economic crisis,India,inflation,Iran,monetary policy,money printing,Russia,trade wars,Turkey,US,weakening currencies,what shape is the US economy in?